We are delighted to see this seedling flowering for the first time. The seed is from our original plant, that we have since lost, and it has taken eight years from pollinating the parent to seeing this seedling flowering. 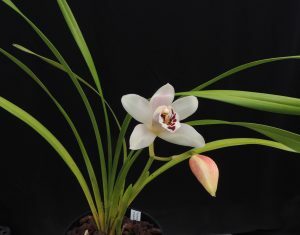 It brings the Cymbidium species featured on 365 days of orchids up to 17 species which represents about 1/3 of the genus. 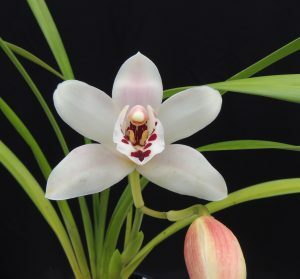 Cymbidium sanderae is a rare plant and restricted to a small area in Vietnam where it grows as an epiphyte between 1400 and 1500m in evergreen forest. It is closely related to Cymbidium insigne which has similar flowers but a different growth habit (more of that later in the week) and is therefore likely to be a deceit pollinator, like Cymbidium insigne, and attracts bees by mimicking a local species of Rhododendron. We don’t mind being fooled by this species and it is a joy to have it flowering in our collection again. We are also pleased to have a good number of Cymbidium species seedlings growing in-vitro, as we always feel that more should be available for growers.